The Papaschase band was recognized as a member of the Assembly of First Nations on Thursday, a milestone for the community as it works toward recognition from the federal government. 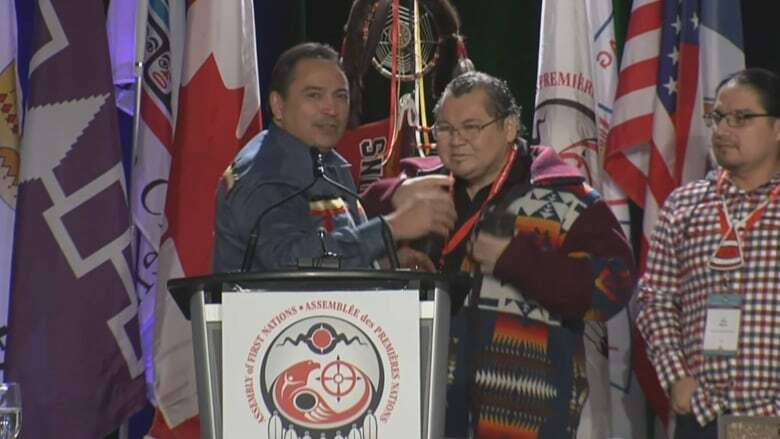 AFN National Chief Perry Bellegarde welcomes Papaschase Chief Calvin Bruneau after the band was officially recognized as a member of the assembly on Thursday. "It's been a long struggle and we're very proud to be here today," Chief Calvin Bruneau said, addressing the assembly after a pair of resolution in support of Papaschase band passed unanimously. "We're taking our rightful place as a Treaty 6 Nation and reasserting and establishing our sovereignty, self-determination and self-governance. We're here to stay and we're here to work with you." The Papaschase band signed an adhesion to Treaty 6 in August of 1877 and took up more than 60 square kilometres of reserve land in what is now southeast Edmonton. 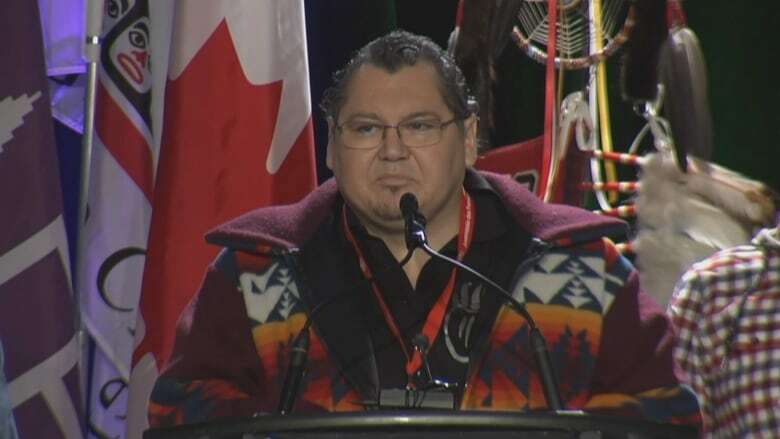 Thursday's resolution passed at the AFN Special Chiefs Assembly held in Ottawa, calls on the assembly to support Papaschase, "in its quest to right past wrongs" and to receive federal recognition. Chief Bruneau expressed hope that the lobbying power of the AFN and the support of First Nations across the country would expedite a decades-long struggle to be recognized by the federal government. Recognition, he told CBC News after returning to Edmonton on Friday, would be the first step toward negotiating a settlement. Some community members were "brought to tears" when they heard the resolutions had passed, said Chief Bruneau. "It was such a momentous occasion," he said. It's been something that we've been wanting for a very long time and to finally see it happen, it was very emotional and very powerful." Within two decades of signing Treaty 6, according to band history, Papaschase people were removed from their land and forced to join nearby First Nations, including Enoch Cree Nation and Alexander First Nation. Others, motivated by starvation and in the absence of federal relief, signed away their treaty rights in exchange for money. By 1930, the band claims the federal government had sold off the entirety of their reserve lands. "There's been no restitution, no compensation, no acknowledgement from the federal government. Our issue has never been addressed," said Chief Bruneau. Chief Calvin Bruneau said the AFN's resolution to acknowledge Papaschase band as a member was "very emotional and very powerful." Now, Chief Bruneau said he wants to negotiate a settlement with the federal government that would see the band establish an urban reserve in Edmonton. "We were kicked out of our home and the city of Edmonton was built on it," he said. "We're coming back home and reclaiming what's ours." The band has around 1,000 "probationary" members, who trace their ancestry back to the 19th-century band list, but who cannot get Indian Status without formal recognition as a First Nation. Chief Bruneau said representatives of the federal government have signalled their willingness to offer that recognition in ongoing discussions with the band dating back to September. "We've made so much headway in the past three or four months, it's not a matter of if we'll be recognized," he said. "It's a matter of when."